It’s hard to know where to file Daddy’s Chicken Shack. Quick bite? Yep. Frontrunner in the fast-casual movement? Check. Immediately addictive with a sensational vegan option for those loveable but holy high maintenance vegan friends of yours, you know who you are? I had to create a new file for that. Fortunately, this place was worth it. Menu on the chalkboard, this petite Pasadena chicken shack is the advent of Chef Pace Webb (Taste of Pace) and entrepreneur Chris Georgalas. 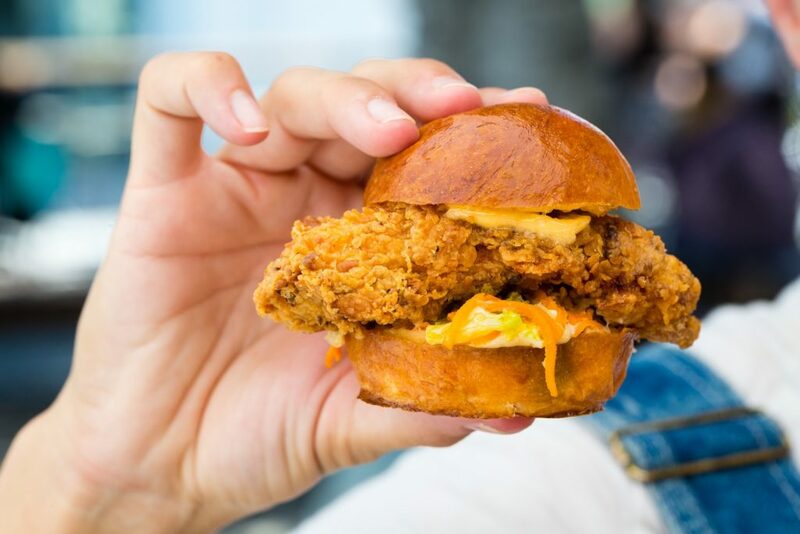 Sharing space with Pace’s catering company, growing from an onslaught of Chicken sandwich devotees bore from the Smorgasburg LA debut, this happy haunt behind the bricks seemed an almost inevitable next step. Some may claim an essential one. The menu is small but telling. People come for their fried chicken sandwich fix, regular and/or the vegan variety, both which made them instantly famous on the Smorgasburg LA (DTLA’s weekly food festival) scene. 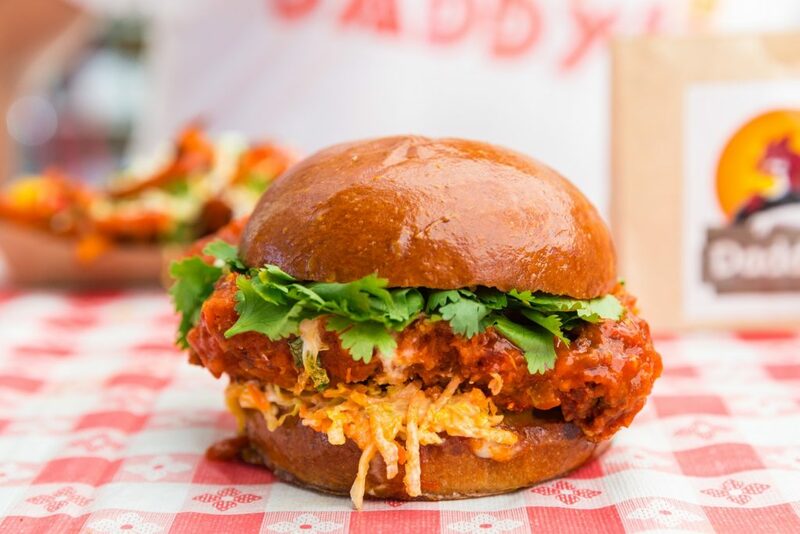 Buttermilk fried, slathered in napa slaw and a tangy sriracha mayo, the BIG Daddy arrives inside a glistening brioche bun. The same can be served up bite size in the Three Little Daddy’s version. Or spicy, or popcorn size. A bite into any of these will validate the need for a dedicated brick and mortar home where we can answer our chicken sandwich callings. But the vegan version. That Vegan Daddy. 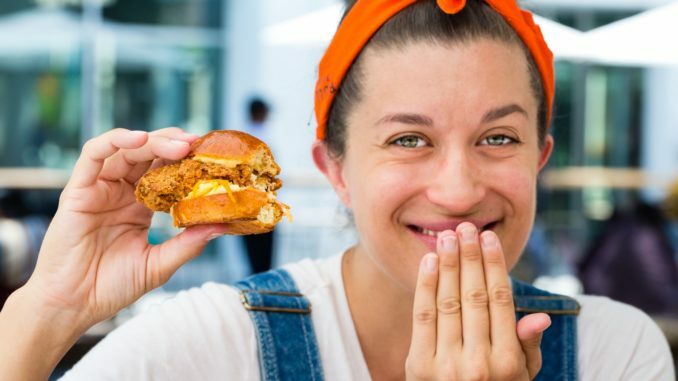 What the impossible burger did for veggie burgers, The Vegan Daddy has responded in chicken(less) form. Coconut curry milk brined cauliflower, sambal vegan mayo, napa slaw, cilantro and mint. Served either inside a sesame seed bun, or aside some lime peanuts, in the nugget version. Nothing about this sandwich feels deprived of anything. Substitute indulgent for sacrificial, in the ways of plant-based eating, it’s next level. Side of those salty paprika sweet potato fries, forget about it. Get back to me if you feel anything less. The day I visited I got to try out a Diet Daddy Bowl; put it on a bed of forbidden black rice, with some shitakes, red peppers, cilantro. Great. And food this fun is incomplete without dessert. A salted miso chocolate chip cookie or a cup of Coolhaus ice cream have got you there. The place, the feel, the food, the founders – it all generates joy. If Luis is working the register, you lucked out, he embodies the entrepreneurial goodness that’s undeniable here. Pace’s Texan touch and Chris’ (half) Asian influence combine to create something seemingly simple, but clearly not. Nothing this well done ever is. Pasadena denizens scored big on this one. And the rest of us now have one more reason to roll into the City of Roses besides football and those floats. Daddy’s Chicken Shack, 11 W Dayton Street, Pasadena, CA 91105, USA. Dayton is a small street, keep a close eye out for it. There’s meter parking on street and surrounding neighbourhood. For now, they’re only open for lunch from 11:00am to 5:00pm. Insider Tip: There are a few barstools inside and one small table plus some outdoor seating. Best to plan on taking your chicken to go. There’s a great park right across the street. Jolie Loeb is a Luxury Lifestyle columnist based in Los Angeles. We are on the delivery apps such as Postmates and Chownow, etc. so you don’t have to wait for the rain to stop! Always looking for a casual bite to eat in Pasadena before or after shopping. Will check this chicken place out the next time that I am on the east side of town. Oh, I’m in Pasadena all the time and need new places to try. This is now on the top of my list! My mouth is watering after reading this delightful review. You know I am going there the next time I find myself in Pasadena. I agree with the comment above – we have a vegan in the family and it’s so hard to find a yummy chicken place that provides vegan too. My whole family will be happy to try this! Thanks! Well you had me at fried chicken! And I wouldn’t mind the vegan option either, it sounds really yummy. If I find myself un Pasadena I will check it out for sure! Everything you describe reaches me just like a perfect little place in heaven. We will stop there on our next day in Pasadena. Might be a perfect entree…..to a latter dessert at Pie N Burger. Sounds like a joyous Pasedenaesque Progresssive dinner. I’m in! Good call Jolie….for me, only decent vegan restaurant to my taste is in Ventura, will definitely give this a try next time I am in Pasadena. Yum! This looks amazing. I just shared on my FB page to see who I can get to brave the traffic to drive over to Pasadena with me to try this. Can’t wait to try the Vegan offering as well. I might have to try this a couple of times just to make sure it’s as good as this sounds. Lol. We are also on delivery platforms so you don’t have to come to pasadena! I’m not vegan but that cauliflower has me needing to be vegan for a day. looks lake a great place! chicken mouth watering but don’t get to Pasadena much it is so out of my way. will tell my friends that live there. I didn’t even know I craved fried chicken sandwiches (vegan or otherwise). Now I have to get through the night knowing what tomorrow will hold! Diet Daddy Bowl, you’re the one for me! Yum! Do they deliver to Hancock park with Postmates etc? I really enjoyed my meal here: the cauliflower sandwich was delicious — good enough to make me feel like I wasn’t missing out on the chicken sandwiches. The sweet potato fries were thin and crispy, accompanied by a spicy dipping sauce, which I always appreciate. They also had old school orange soda in the bottle, which is always a great way to wash down a delicious sandwich. If you’re in Pasadena or looking for something a little different for delivery, definitely check it out. The review here is as fun as the food sounds! Glad I didn’t miss it and I’m not going to miss the restaurant either. Yay! Fast-casual was the best concept to arrive since sliced bread! 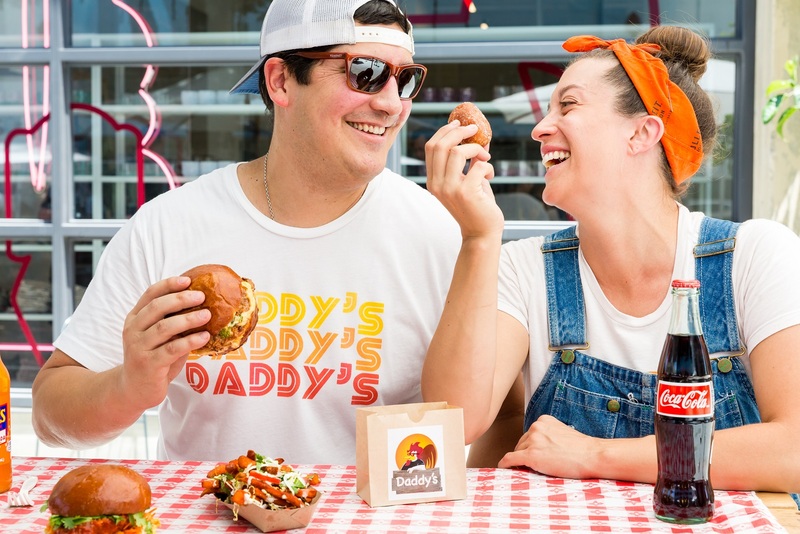 Haven’t checked out Daddy’s yet – but will now! Thanks for the delicious review! Thanks Jolie! Need to try. Non-meat option sounds delectable! I’m due for a day shopping and hanging out in Pasadena and I will definitely add this spot to my agenda. Finally a place for my growing number of vegan friends and I to eat at the same place!!! Awe. Some. Yummy! A bit of a drive but if I find myself up north… I’m all over this. This place sounds great! Love a good chicken sandwich, and the husband is thrilled to find a good vegan sandwich! I love vegan, first of all and this looks yummy. Am telling everyone about this spot.